MacDara loves every aspect of music making and this comes across in his singing. He is a native of the Aran Island of Inishere and is in tune with nature. He spots what is beautiful in his surroundings and recognizes the perfect song for him. Equally he has the ability to surround himself with the best exponents of Irish music creating a dream team of musicians. The album is co-produced by Máire Breatnach (Riverdance, The Chieftains, Christy Moore, Brian Kennedy), who also provides some beautiful musical accompaniment along with Johnny McDonagh (Dé Danann, Arcady), Bill Shanley (Paul Brady, Mary Black, Tommy Fleming), Ennis’ own Danny Byrt, Paul Gunning, Mick O’Brien and MacDara’s sister, singer Lasairfhíona. 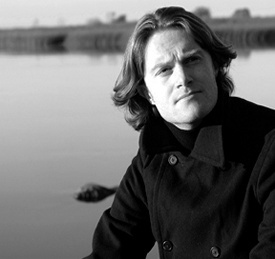 MacDara featured on the Lasairfhíona album, An Raicín Álainn, issued in 2002 and continues to impress listeners all over the world with the song “Bímse Féin Ag Iascaireacht”. He has performed all over Ireland and at international music festivals, such as the TradIt Festival in Holland, Quessant Salon du Livre International Festival, in Brittany and the Cambridge Festival. And just recently MacDara has performed at the Colmcille Scottish-Irish Festival. “MacDara’s command of the text of the songs and his ability to give them life within what is essentially a non-tradtional format will surely single him out as a distinctive talent to watch out for in the coming years”. Seán Laffey, Irish Music Magazine.